I have a super duper huge crush on taco salad. As in, I could eat it every night of my life and be totally ok with it. It’s kind of like this secret hidden craving-slash-confession I’ve been dying to share with you. Thanks for letting me get it out there. I hunt it out at potlucks and try to throw it in our menu plan more often than is probably ethical. I’m positively gushy about taco salad, but seriously, after you try this chopped version with homemade catalina dressing, you might be just as gushy as I.
Solidarity in gushiness? Or not. As if the taste-factor (which is off the charts good) isn’t enough, this meal comes together in less than 30 minutes and is perfect light and refreshing meal for the blazing heat of summer (confession: we eat it all winter, too). It’s basically a big honkin’ plate full of color and flavor and love and taco salad goodness. And the gargantuan plate you see here? That’s my itty bitty little serving cause I’m all about portion control. If you are stressed about serving a main dish salad to kids, my tactic is to serve the salad with a platter of fresh fruit and vegetables as well as a crusty roll (or other type of heavily sought after carb) and often cottage cheese on the side. My kids actually really like the commotion of this salad and kind of pick their way through it, eating their favorite parts and scooping up the rest with their rolls. It’s a pretty difficult salad to resist whether you are a kid or not. 1 cup cubed (small) cheese, cheddar, Monterey Jack, Pepper Jack, etc. In a large, nonstick skillet, brown the ground turkey or beef with salt and pepper (about 1 teaspoon of each) until cooked through, breaking up the meat into bite-size pieces as it cooks. Drain excess grease if needed. Scrape the meat onto a paper towel-lined plate and set aside to cool a bit. For the dressing, combine all the dressing ingredients together in a blender and process until smooth. Refrigerate until ready to serve. The dressing can be made up 3-4 days in advance. 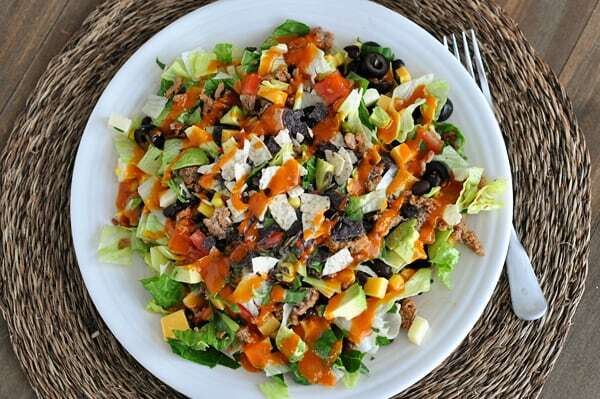 In a large bowl, toss all the salad ingredients together (including the cooled meat) except the crushed tortilla tips. Serve the salad with the dressing and crushed tortilla tips. I've been using the Heinz natural brand of ketchup without any HFCS and really like it - use a brand you like the taste of for the dressing. Also, if you want to take the dressing up a notch, use smoked paprika instead of regular. I prefer the ground turkey or beef simply seasoned with salt and pepper but if you want more kick, try adding cumin, chili powder or a variety of other flavors to the meat while cooking. I made this last night after seeing it on your “Recipes the World Forgot About” post. I was already planning on making your turkey tacos (which I make weekly and are the best) so I used that meat for the salad. My family was skeptical bc they were expecting their normal tacos but oh my goodness we all went crazy for this recipe! The dressing was delicious and paired perfect with the flavor of the salad. I’m so happy to hear this, Gilliane!! Yay! The Catalina dressing was absolutely delicious! Thank you for sharing! I have been making a taco salad for myself for lunch every so often and had been using store bought Catalina dressing. I didn’t really like the taste though and wasn’t sure what other kind of dressing I should use. Today as I was whipping one up one of my yummy salads, I remembered seeing your recipe to make Catalina homemade. It was sooooo good!! Tastes so different than the store stuff. It made my salad very delicious and without the additives of dressing you buy at the store. A win win! The onion I used was pretty strong so my mouth tastes like a big onion now, but it is worth it! Thanks for the recipe! We add chorizo to our hamburger meat. SO good! I made this for dinner last night and we just loved it. I upped the turkey to 1.25 pounds and thought it was just fabulous with the salt and pepper. The dressing gave everything else so much flavor. My oldest is graduating high school this Thursday so we are in need of easy and quick meals this week and this was perfect! I made this recipe for my family during a particularly hot day and it was a big hit! Even my ranch dressing loving husband gobbled it up. Made this recipe last year and again today! Loved it! Used taco seasoning in meat. Scratched iceberg only because with 2 in the house we don’t eat a lot of lettuce. No avocado my only one was bad. Loved the dressing. Oh and I didn’t grow up on Catalina dressing so I don’t know it’s flavor… However I truly enjoyed it and thought it paired well with the salad ingredients. Mel, I have to say that this homemade Catalina dressing is a game-changer for my family! 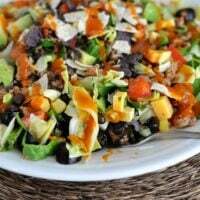 I grew up eating taco salad with Catalina dressing but I had never made the dressing before… I threw together my family’s basic taco salad using this dressing recipe and it was spectacular–my husband and kids really loved it and my husband commented more than once on how much better this homemade version is. Many of your recipes have become my “go-tos”. Thank you for the time and effort you put into the things that you do–it’s so appreciated. Thank you, Tristin – that means a lot! Awesome recipe!!! Try adding taco seasoning to your meat. We grew up on this in Texas in the 80’s. Hey, Mel! I read another male poster’s comment and got inspired to finally sing your praises. I stumbled upon your blog a few months ago, and now I make your recipes 3-4 nights a week. I made this taco salad last night, and it is, in fact, the bomb (almost as good as the curry nachos with mango salsa). From now on, I will holler whenever I make a recipe! You deserve to know how awesome they are. Oh, thanks Sidney! Loved your comment! Made this in Rwanda last night, and it was awesome. It was just what my mother made in the 90’s for us and now that we live so far from convenient stores, I am thankful for every scratch recipe I can get! Love it, as did my kids and husband. Thank you. This is a wonderful taco salad. I added some chile powder and cumin to the ground beef to give it a bit of an extra lift. The dressing is delicious and can be made ahead, making final dinner prep that much easier. I definitely recommend this recipe. I finally tried this recipe last night. I wasn’t too sure my family would like it, but i was wrong. My husband who is not a fan of taco salad liked it and said he would like it again. Normally when i make taco salads, he says I just am not a fan of this. But this was really good and so easy to make. I will be adding this to my recipe book for the future. Thanks for all the great recipes. Makes me keep wanting to come back for more and see what else you have in store for us! I really enjoyed this chopped salad! Thought the dressing went nicely with the salad. I added too much lettuce! Didn’t have tomatoes! I REALLY wish people who leave comments would leave REVIEWS. All those other words are meaningless. I made this dressing last night; actually found the recipe on several other sights. I added honey and granulated garlic (or garlic powder). I love that I can have my go-to dressing without HFCS. As the author of this blog said, I, too use a ketchup (Simply Heinz) that also has no HFCS. The home made salad dressing was just okay….if you are expecting it ti taste like Catelina you will be sadly disappointed………. Like all your recipes, and to add to all of the above, this was perfect and delicious. Thank you! I love a taco salad, and I love Catalina dressing, so sure, I’ll try this. Sounds great. But don’t you mean tortilla chips, and not tortilla tips? You put tips in twice under directions. Sounds sooo yummm, my kid’s will love it. This was beyond yummy. The dressing was probably the best Ive ever had. I did add some spices to the meat. My boyfriend devoured it too! I doubled the recipe. I used smoked paprika instead of regular for a little smoky flavor. I think I would use less sugar. It’s a little too sweet. But overall very good. 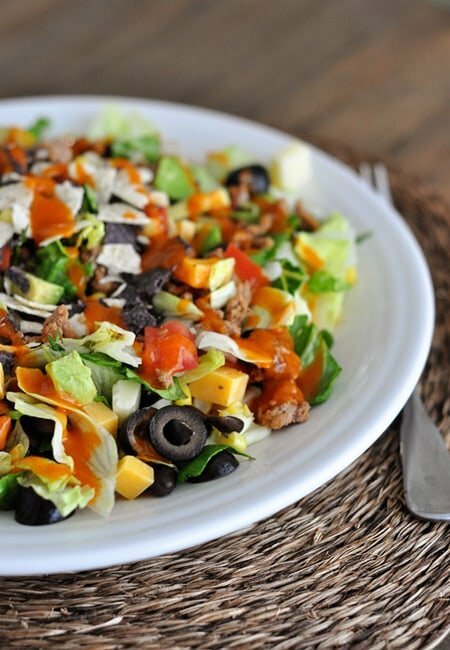 I share your love of taco salads, and this salad takes that love to a whole new level! The dressing MAKES it – – definitely has become a staple at our house. Thank you, Mel! The opening of this post could have come straight out of my mouth– I too am a taco salad addict and we like it best with crushed tortilla chips as well (I think that’s a TRUE sign of an addict)! I’m so excited to try your catalina dressing– we usually do homemade fry sauce & ranch. I made this tonight, and LOVED it. My 4 year old scarfed 4 plate fulls. 🙂 We usually do Taco Salad with: ground turkey, beans, rice, lettuce, tomato, cheese, olives, chips, salsa, sour cream. Don’t get me wrong, we love it that way too, but this recipe was just so much more light and fresh. It was super yummy, thank you for the recipe! I will definitely make again! Just made this for dinner tonight & it was DELICIOUS:))). The hubby loved it!!! Ha, I have the same love affair with taco salad! Luckily my kids also love it! I have always used kidney beans and corn in mine too! I am so excited to have a home made catalina dressing recipe! We always use Catalina on our taco salad! Delicious! I’ve made it twice and feasted on it over several meals each time. The dressing gets better as the days go by. I’m already looking forward to having it again (and again and again) very soon! This salad was amazing! The Catalina dressing was delicious! We liked it so much, we had it two nights in a row, and substituted chicken the second night. The first night I made a homemade taco seasoning for the ground beef, the flavors were excellent. made it tonight…delicious. Husband said “super yummy”! This was a great salad! The dressing was perfect. I added taco seasoning to the meat and loved the flavor. Great recipe! ^^Amanda is right^^ The dressing is the best and I had extras like pickled jalapenos and sour cream. Yum! This salad was outstanding!! The homemade Catalina dressing was sweet, tangy and amazing. I can’t go back to the store bought now. I added some chopped fresh jalapenos for a kick which turned out well. Thanks for another keeper!! It sounds wonderful and similar to the one I make. I make the dressing with lower calories by combining catalina dressing with Greek yogurtt and salsa.I wonder if I could try you receipt without the oil, adding the yogirt and sales instead. This was very delicious, and I loved the homemade dressing. I’ve made numerous things from your site and they are all YUM! Thanks! I made this last night and the family loved it. It is very light and was refreshing for dinner during this heat wave we are having out east. I had more than 2 helpings and had some left overs for lunch today. And I’ve sent the link to friends so they can make it too. Over the weekend I made the crock pot sweet & sour chicken, another big hit. Good all on it’s own even better in a fajita!! Thanks again Mel. I’ll be trying those 100 recipies to cook when it’s hot, because it has really been hot! Made this last night for my in-laws and we all loved the dressing – it adds a great kick to the salad. The cilantro is a huge fresh bonus to the salad. Thanks Mel! I finally had the chance to make this last night. The hubs & teens looked less than ecstatic when I told them what we were having. Needless to say, it was devoured!!! I served mine with Fritos. The dressing, oh my the dressing…. out of this world! Thanks for (another!) awesome recipe! I love taco salads! And with this version I get to add two recipes to my repertoire, the salad and the dressing. The only change for me is to bake a flour tortilla into a taco salad bowl in one of those metal forms. That way I get to eat a part of the bowl with every bite, and no extra salt. Large tortilla bowl for hungry nights and smaller tortilla bowl when I’m being good, or for the kids. Thanks! Well I hate to diversify your comment page by being a male but when you wax so ecstatic about a new recipe you are almost daring us to try it and see if you are exaggerating. As usual, you are not exaggerating. This taco salad was absolutely incredible. Maybe someday another male cook will show up here. Thanks again. Hi Dwight – always good to hear from you! I doubt you are the only male follower, but yes, you are definitely in the minority which is even more special that you take the time to comment. Thank you! I had everything in my refrigerator for this and it all needed to be used up so it was perfect! My first attempt at Catalina dressing and it was so easy and so good! We used fritos (they needed to be used up too) and I actually ended up adding more lettuce because the salad was being devoured so fast I needed to extend it a little. Thanks for another fabulous recipe! OK, so the DAY you posted this, I had leftover meat from nachos in my fridge … its destiny was not looking good since my husband is not so much a fan of leftovers. I had everything on hand to make this salad, though, and so the meat found a new home. I was feeding the LDS missionaries that night, so this really simplified things. Not only that, I had way too much left so I put it in a large ziploc bag and we threw it in the cooler for the water park the next day with a little jar of the dressing. We felt like kings eating that lunch. Thank you, thank you!! It is a GREAT recipe! I grew up eating taco salad with Catalina dressing but haven’t had it in years. Can’t wait to try this!! 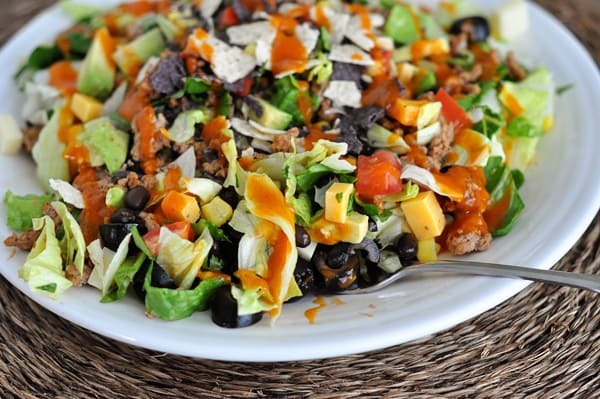 This looks so yummy and now I have a craving for taco salad. This is going on the meal plan for next week! I mentioned to my husband that we were going to be having a taco salad for dinner and that lack of excitement on his face left me with concern. Needless to say, I pushed through and made it anyways and while we were eating he said, “this is so good” at least five times. Then he proceeded to ask for leftovers in his lunch. Thank you for the recipe! It was a hit in our house and we plan on making it many more times. Love the blog! Made many family pleasing hits from it! Hi Mel, thanks for all your good recipes. I’ve always hated cooking because I’d look on allrecipes and find some highly rated recipes and then they’d turn out gross so I wasted my time. Plus I never saw my mother cook (because she never cooked) so making good food seemed so out of reach for me. But now I’m making your recipes and I’m so happy and successful in the kitchen. Thank you so much! And my new thing is to take your freezable recipes and double them, then divide them into four tin foil 8×8 pans and freeze the other three. Doubling takes just a little more effort AND I have this freezer “full” meaning like four different recipes of stuff, of frozen food so when I know someone that has a baby, it’s easy to sign up for a dinner and bring it ahead of time. OR like my friend had mastitis and I found out and it was so easy to take the creamy green chili enchiladas dish I had frozen at my house and bring it to her for tomorrow’s dinner. So not only am I rockstar in the kitchen, but I’m rocking the service arena as well! I feel really good about myself (seriously, I do). And I have five kids eight and younger so I feel like I’ve saved more time to fret about how messy my house is. So thank you Mel, you’re a blessing! (And, ahem, if you have any more freezable meals, I’d really appreciate them, ahem). hd it last night and had 3 helpings!! thanks a bajillion mel! What? You can make Catalina that easily? Fabulous! I love my taco salad with Fritos instead of corn chips. Yum! I think that I need to make this tonight! This looks SSSOOO yummy! Catalina dressing is absolutely one of my fav’s! As always, I know why I read your blog and make nearly every meal from it since I found it… I know I know… just about everyone says this…. However, I want to say that this recipe includes pretty much every flavor that I LOVE the most, I believe it was totally “meant to be” for me to find your blog, it has made my life so much better & easier… and my groceries costs have gone down, just my style of cooking is what you do here, and since you’ve already tried everything…. EVERYTHING is always a hit… My kiddos believe we are friends who talk regularly and exchange recipes 🙂 …. if only it were so!!!! Just wanted you to know 🙂 THANKS!! Homemade Catalina??? Awesome! I love that stuff! layered cornbread salad for me. It was so good! And to top off a perfect meal, she made the chocolate flan cake (per my request.). Everyone agreed, the best birthday cake ever! Looks delicious – thank you! We’ll be having this for dinner tomorrow evening. Oh, Mel! I adore these two things myself! Taco Salad and Catalina…yum yum! Thanks for sharing what looks to be a fabulous recipe! This looks so great and I love that you made the catalina dressing! My husband loves Catalina dressing. I will be trying your recipe this week for sure. We just had taco salad last week and I had forgotten how much I love it! We also out Catalina dressing on it with a scoop of sour cream. I will have to try the homemade version if Catalina! Yum! Yum! I’ve never had Catalina dressing on a taco salad before, but this sounds delicious! And I’m never quite sure how to serve my kids a salad. Thanks for the tips! I’ve never had Catalina dressing before, but from your raving review, it definitely seems like I need to get on board and try it! Such a perfect summer meal! Looks so scrumptious and I love the homemade dressing! Perfect! I was planning on making taco salad tonight anyway and now I can’t wait to try this dressing! That looks super yum! Summer salad – delicious. Just get right out of here with this. And HOMEMADE Catalina? Just yes. I love an easy, but filling salad. And seriously, we have dropped the ball this summer. Miss you sweet friend! Let’s talk soon! Taco salads are sort of my thing too. I adore them, but I very rarely make them! Love the sound of this one, especially with that dressing! A good taco salad is the absolute best! This looks awesome!